Congratulations to the royal couple on the birth of their second baby. That is the message on this beautiful cross-stitch sampler with its two stately peacocks guarding the new baby’s crib. If you collect Royal commemorative needlework, or memorabilia, you won’t want to miss this sampler – especially if you already have one for Prince George. 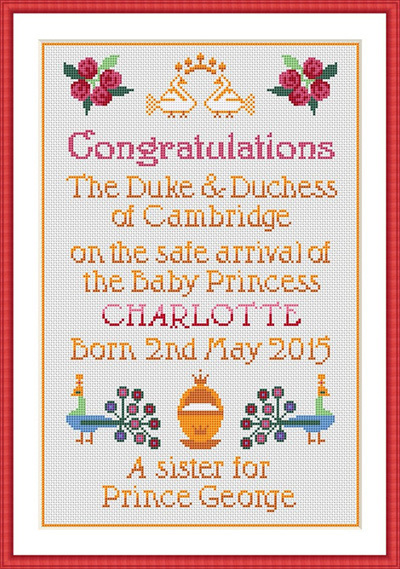 A beautiful cross stitch sampler to welcome baby Princess Charlotte, born to the Duke and Duchess of Cambridge on the 2nd of May 2015. In the kit: 14 count Aida fabric, needle, Anchor embroidery threads cut to length, full colour chart and stitching instructions.